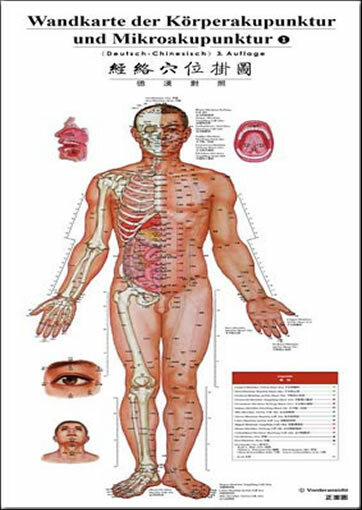 This full color acupuncture wall chart describes 12 regular channels, the Ren and Du vessels and their points, as well as standard extra points. Alphanumeric designations and traditional Chinese characters are both presented. Three charts depict anterior, posterior, lateral views, and are identical to PMPH’s Acupuncture Point Wall Chart. The fourth and fifth charts are entirely devoted to Microsystems: scalp, foot, face, ear, and wrist and ankle.